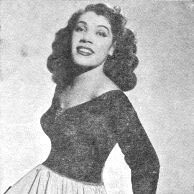 March 13, 2009 Anne Wiggins Brown, soprano and the first African American vocalist admitted to the Juilliard School, died. Brown was born August 9, 1912 in Baltimore, Maryland. She studied at Morgan College and applied to the Peabody Institute, but was rejected because of her race. In 1928, she was admitted to the Juilliard School and in 1932 won the Margaret McGill scholarship as the finest female singer at the school. In 1935, Brown created the role of Bess in the original production of “Porgy and Bess” which ran on Broadway for 124 productions. Following the show’s run on Broadway, it toured the United States. When it reached Washington, D. C. it was scheduled for the National Theater which was a segregated theater. When Brown became aware of this, she responded “if black people cannot come hear me sing, then count me out.” Eventually management gave in, resulting in the first integrated audience for a performance of any show at the National Theater. Brown returned to Broadway in the 1937 musical revue “Pins and Needles” and the 1939 play “Mamba’s Daughter.” In 1942, Brown left the United States because of continued racial prejudice and toured Europe until 1948 when she settled in Oslo, Norway and became a Norwegian citizen. Due to health problems, Brown quit singing professionally in 1953. Brown published her memoir, “Songs from a Frozen Branch,” in 1979 and in 1998 she received the George Peabody Medal for Outstanding Contributions to Music in America from the Peabody Institute, the institution that had denied her education earlier. ← March 12th in African American History – Charles “Bird” Parker, Jr.
January 15th in African American History – Martin Luther King, Jr.